Good Morning Onward Nation — I’m Stephen Woessner. It is an honor to be with you here this morning, and my hope for you is that this week — the final week of April 2016 — has brought you happiness, that this week has also brought you success, that this week has brought you opportunity, that this week has brought you some challenges that have pushed you to expand your knowledge — to learn new things — and most of all — I hope during this week — and right now specifically — you will give yourself the time to consciously consider whether or you have given you and your team the FREEDOM TO FAIL. Yes…you heard me right. I said the FREEDOM TO FAIL. It is fascinating to me how the word failure has become all the rage — almost a buzzword or mantra — and is being used by personal development gurus, digital marketing consultants, business leaders, to politicians. But these three simple words — FREEDOM TO FAIL — have a completely different meaning to me because of my experience this past weekend. 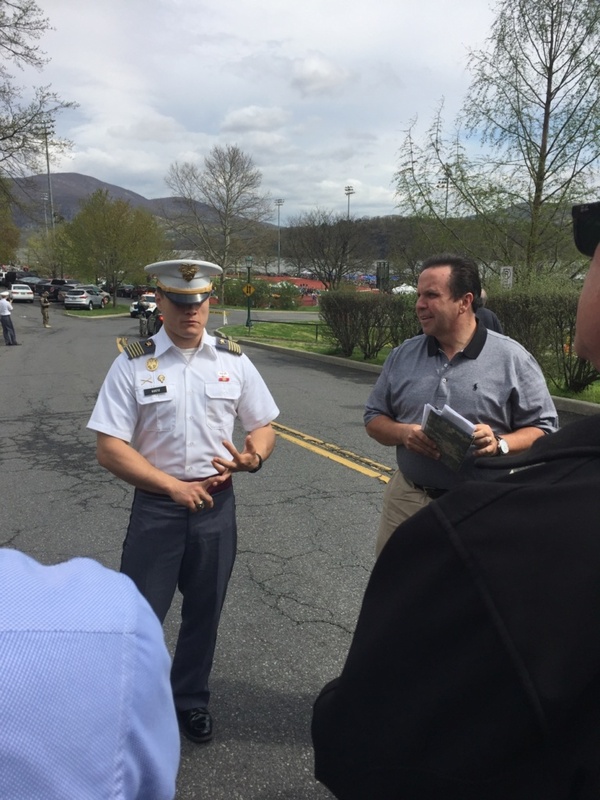 I spent Saturday at West Point…the United States Military Academy in New York State. To say that spending the day at West Point was a life-changing experience would be a significant understatement. My pride as an American citizen soared. The honor I felt since serving our country in the Air Force was taken to a whole new level. And to top it off…I was able to share the experience with a group of friends who we affectionately refer to ourselves as the Circle of Greatness. At the center of our group — our founder father so to speak — the man who pulled us all together, first to meet one another, and then to develop some wonderful friendships, is Don Yaeger. I hear me mention Don in nearly every episode of Onward Nation because he has been one of my most influential mentors, my weekly accountability partner, and has become one of my closest friends. There are about 30 of us in the Circle — and this weekend — 20 of us were able to make it to New York City for a weekend together. All of which was masterfully orchestrated by Jeanette Yaeger, Don’s wife. Jeanette — if you are listening — thank you so much, my friend. You are beyond amazing!!! 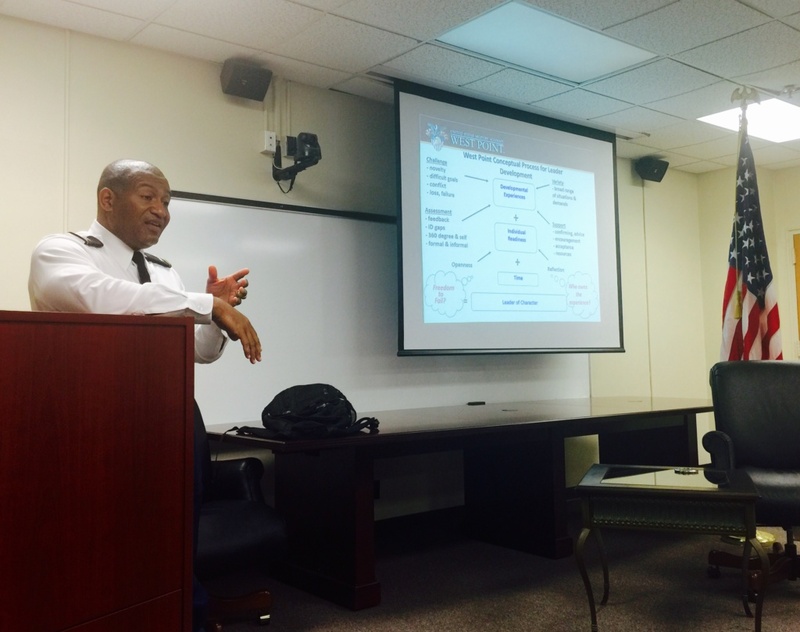 One of the members of our Circle is Colonel Bernard Banks, professor and department head of behavioral sciences and leadership at West Point. 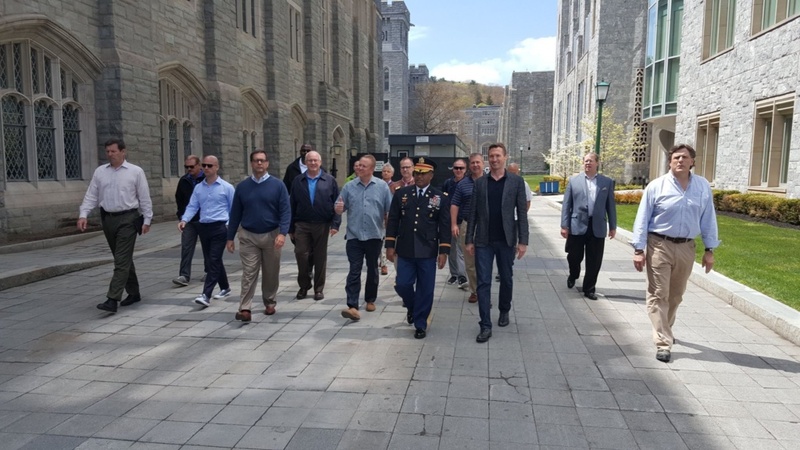 Colonel Banks invited all of us to West Point to spend the day as his guest and to learn about the values and leadership development process they apply to create our nation’s next military leaders. When we all read that West Point was on the agenda for the weekend…we were all excited for the lessons that were about to come our way and extremely grateful that such an uncommon opportunity came our way. To be the guest of Colonel Banks — at West Point — for the day…are you kidding me? Incredible! Onward Nation, being at West Point was one of the most intimidating — inspirational — and humbling experiences of my professional career. So buckle in, Onward Nation…I promise…this discussion will help you move your leadership development process within your business to the next level. What I just read to you is know as the Cadet Prayer. Anyone can see it — read it — as they enter the academy. It is proudly displayed inside the Thayer Hotel at the entrance to West Point. When I thought deeply about both of these powerful statements — these core values — I was taken back to episode 18 of Onward Nation and my powerful conversation with Larry Broughton. During our conversation — it was Larry — who first taught me the Cadet Prayer — in fact, he recited it during our interview. After all these years…the Cadet Prayer was still his mantra — the creed by which Larry lives each day and how he leads his company. Larry had learned it during his 9 years of service in the US Army Green Berets. So to read it at West Point brought me full circle and reaffirmed how important it is that we honor our core values — that we as leaders personally stand for something our employees and customers can believe in — and that our business lives our core values every day — just like the cadets and faculty at West Point do. Day in and day out. Leadership Lesson #1 also involves honoring our history because our past is critical to our future success. Our ability to study the failures, the challenges, the tribulations, and the triumphs of leaders who have gone before us — and then applying what we have learned — will almost assuredly accelerate our own accomplishments. At West Point, when you walk around campus, you will see statues, monuments, and buildings dedicated to our country’s greatest military and political leaders — as well as the conflicts and wars where they lead. So our cadets — this country’s future leaders — have an opportunity to be reminded of what has already been learned so that experience, wisdom, and perspective can become their guide throughout their own leadership development process. Our Circle members were able to see first-hand how seriously the cadets at West Point take leadership. And I was reminded of this quote. Even though that mantra — that purpose — was created and used by the Navy Seals…it was evident the West Point cadets believed its message throughout their corps of cadets. When we arrived at West Point, we were greeted by three cadets and Colonel Banks waiting outside the Thayer Hotel. The cadets were in charge of escorting us from the hotel to the athletic complex so we could watch the opening ceremony and the Special Olympics competition taking place. Every year, West Point hosts the largest Special Olympics competition in New York State, and the cadets play a very active role in service to the Olympians. An amazing site to see. Our cadets briefed us on the logistics and schedule of the day with precision. We had a lot of places to be and not much time in each location. Plus, there were 20 of us to keep track of. Not an easy task. But, the cadets were prepared with every detail. It was evident they didn’t just show up to be our guides for the day because Colonel Banks had asked them to…or because Don Yaeger also serves as a senior fellow at West Point. The cadets had studied, they had planned, and they were ready to help us make this a day to remember. The cadets also served as our historians for the day. They taught us about the pivotal role West Point had played during the Revolutionary War including the story of Benedict Arnold and the plan he and the British had conspired to create with the goal of capturing General George Washington during his visit to West Point. Our cadets also took the time to explain — and — to take us inside the day and life of a cadet. They shared their passion — their desire — to ultimately receive the reward of active duty status in the Army upon graduation. Amazing. West Point is home to 4,400 cadets who all share the same passion, drive, and determination to become prepared to serve our country as military leaders and beyond. Our cadets — all of the cadets — are an extraordinary group of people and I look forward to my next opportunity to visit West Point and learn more leadership lessons from them. I mentioned a few minutes ago how West Point, its faculty, and its corps of cadets host New York State’s largest Special Olympics competition every year. Why? Because Leadership Lesson #3 that I learned at West Point is about seeking out opportunities to serve and encourage others. To illustrate how the cadets not only serve — but encourage — I included a short 30-second video of the cadets and several Special Olympians during the javelin competition. As I watched the Olympians and the genuine, authentic encouragement and love they received from their cadets — I was moved. It was such an emotional experience to see a group of young men fully focused, devoted, and present for their mission for the day. And they did their duty — not out of responsibility because they had been assigned — but as you will see in the video — they did their duty because they loved performing the service. They were overjoyed to celebrate the successes of the Special Olympians. Onward Nation, our cadets, actively seek out opportunities to serve and encourage each other — and they are also committed to living these values outside of West Point as an example of excellence. West Point’s upperclassmen mentor, coach, and lead their underclassmen — not by yelling, hazing, or by rank. Instead…and this may seem counterintuitive when thinking about the United States Army…but the cadets “hug” and then “push” each other. They hug and then push. Each cadet — along with the faculty of this impressive campus — is there to serve one another to help every one growth, develop, and become the leader they were meant to become. Plus, as we later learned from Colonel Banks, many of these 4,400 cadets will serve and work alongside one another for decades into the future. They will be forever bonded by service and encouragement to each other and to their core values. So it was a very special sight to see the cadets live their values — in how they treat each other — and how they stand shoulder-to-shoulder with their Special Olympians to serve and encourage. What an incredible display to have the privilege to witness. During our day at West Point, Colonel Banks surprised us by inviting us into his classroom for a private leadership session. 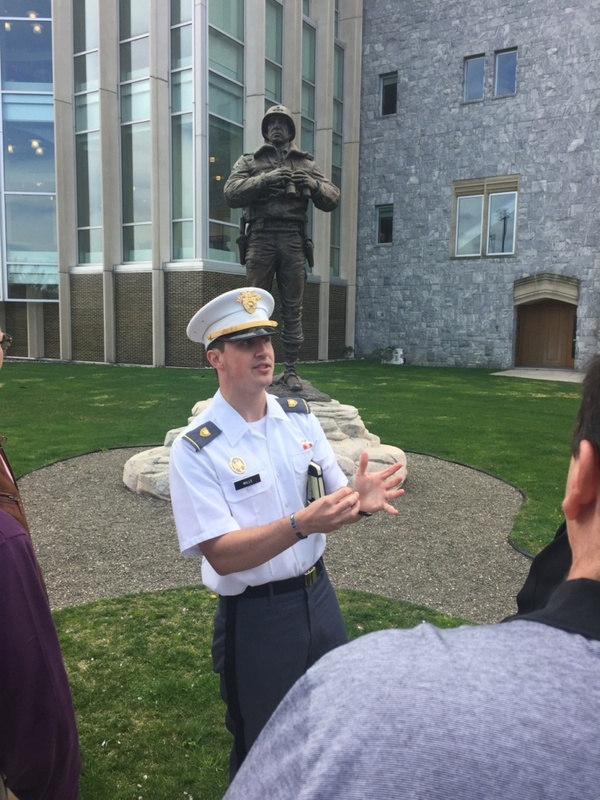 He asked if he could take some time to share and illustrate to us West Point’s three stage leadership development process as well as the curriculum cadets need to master before they can graduate and become officers in the United States Army. West Point created — then applies — an intentional process for leader development. The faculty at West Point believes that great leaders are developed — it doesn’t happen by accident. But this leader development process would not be possible without two critical foundational philosophies…and those are…cadets must be given the FREEDOM TO FAIL and cadets must be clear on WHO OWNS THE EXPERIENCE. 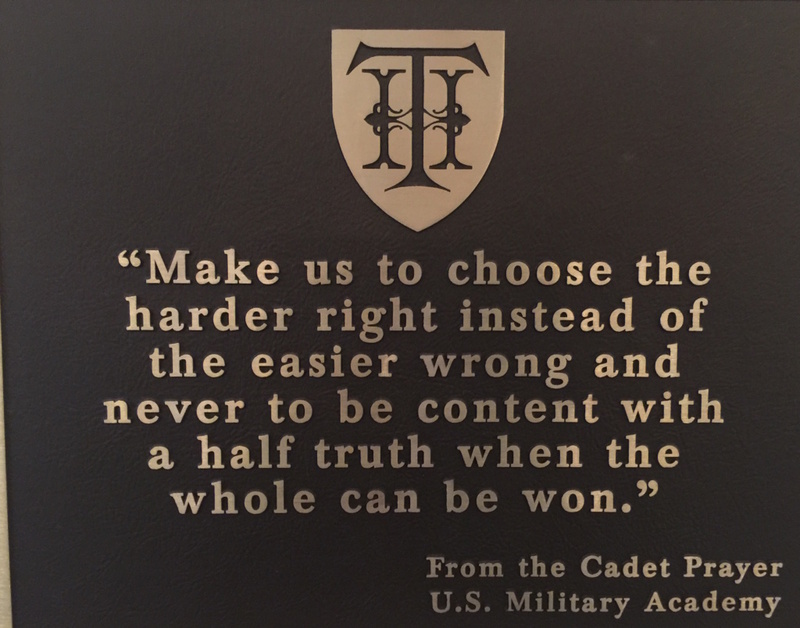 If cadets are not given the freedom to fail — to make their own decisions based on what they have learned from other cadets and faculty — then they will never learn. Instead, West Point will have created cadet robots and not leaders who can think under extreme pressures and situations. However, if they are given the freedom to fail and then mentored on the path to improved performance — mastery can be reached and excellence obtained. Colonel Banks told us that they are in the business of tearing muscle with purpose — so that it can be rebuilt and it becomes stronger where the initial tear was. Awesomeness. And the cadets know they own the experience. They are not alone in their journey — they have all of the resources of West Point available to them — but ultimately, success or failure is their responsibility. No excuses. No pointing fingers. They own the experience. Impactful lessons taught at an institution I am so proud to have been able to visit and spend time at in such a deep and meaningful way. Colonel Banks…if you are listening…thank you so very much for generously sharing your expertise and wisdom with us — we are all so grateful. One of the most valuable lessons I have learned from Don is something he learned during the 12-years of one-on-one mentorship with the late Coach John Wooden. Coach taught Don that he would never outperform the people he spent the most time with. In fact, the people you spend the most time with — in effect — become your inner circle. So, you need to protect your inner circle by being very selective and deliberate about who gets access into your circle. Don practices this lesson with precision. How? Don investing the time and energy to create our Circle of Greatness is an excellent, tangible example of being deliberate with Coach Wooden’s strategy. And I encourage you to take the same lesson out of Coach Wooden’s playbook. So Onward Nation, my challenge to you is to think about who you spend the most time with. Are they moving at the same, or even better yet, a faster pace and tempo then you? Are they doing things in their life or business that challenge your own perspectives of what is possible? Are they growing personally and professionally in ways that push your comfort zone? If so — good — these are people you should spend more time with. Or, are they content with life and not learning anything new? Are they so full of potential but don’t seek out any new ways to apply their talents and gifts? Onward Nation, my hope is that you will begin to think carefully about each person in your inner circle. Ask yourself…are they headed in the same direction as you? If not, you need to make changes so the people closest to you become your own version of a Circle of Greatness. We all need a Circle of Greatness in our lives to “hug and push us” to that next level — just like the West Point cadets do for each other. We will be back tomorrow with an incredible encore interview with Dave Denniston, host of the Freedom Formula for Physicians podcast. You will not want to miss this discussion, Onward Nation!